Some of you have asked me to write in Dutch as well. As English is not my mother-tongue language, I thought why not! So, from now on, it will be 'Double Dutch'. Well, having said that, Double Dutch means nonsense... I certainly hope you won't think it is all nonsense I am telling you. LOL! Just scroll down for more English (in cursive). Het is de laatste dagen kleur-bekennen geweest, letterlijk en figuurlijk! Kleurcombinaties uitzoeken voor dozen en het besluit om zowel in het Engels als in het Nederlands te schrijven. Hiernaast kun je zien dat ik misschien wel teveel verschillende kleuren boekbinderslinnen heb. Maar ja, ik zou niet weten waar ik het hier in Brazilie zou kunnen kopen. Dus voorlopig kan ik vooruit. For the last few days I have been making decisions about colour coordination. Maybe I have too many options! These are rolls of bookbinders material I use for making boxes. 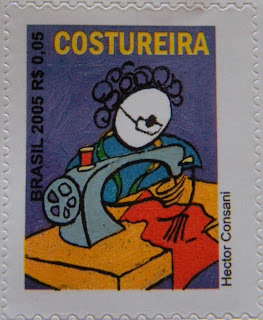 It will last me for some time which is good, as I do not know where to get this material in Brazil. For the next custom box I am going to use these papers and purple bookbinders linen. The lid is with a 2mm thick glass top. I was lucky to find a shop nearby that cuts glass in every size you want! The corners are covered with strips of linen and the papers are cut to measurement. Gisteren aan de slag gegaan met een doos met glazen deksel. Gelukkig vrij snel in de buurt een winkeltje ontdekt waar ik 2mm glas op maat kan laten snijden. De randen heb ik met boekbinderslinnen bekleed en het papier zo op maat gesneden dat het patroon van links naar rechts doorloopt. De bodem heeft opstaande randjes tot halverwege en die vormen weer de basis van een lade die heen en weer kan glijden. Makkelijk voor als je iets uit een van de onderste bakjes wilt halen. De lade heeft twee vakjes met een deksel. De Sieraden Doos is klaar! To the insides I made flanges until halfway up and these are the base for a tray. This tray can go from left to right, so you do not need to take it out when you want to take something out of the bottom part. Two boxes with a lid inside the tray make this Jewelry Box complete! My first order in São Paulo to make a few boxes! This gives me hope that my 'business' of box-making may start sooner than later! This order is for a tea box and two jewelry boxes with a glass lid. The lady that ordered the boxes has lived in Burkina Faso for some time and has fond memories of those years. 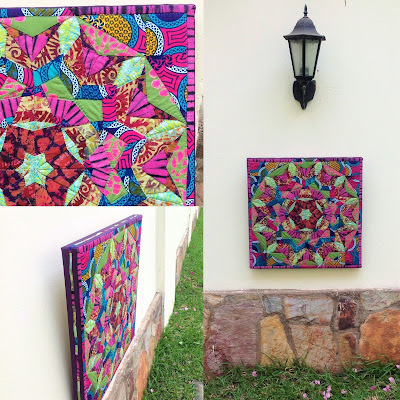 I happen to have quite a few African batiks and she choose one of them to cover the tea box with. As some of you have asked me before how I make the boxes, I made a few pictures along the way. The measurement of the box is 25 x 22.6cm by 8.5cm total height and I used 3mm board for the outside box. One piece of fabric is used to cover the whole box. First, the bottom part is covered with the fabric and than the top part. The very last part to be covered with fabric is the back side. 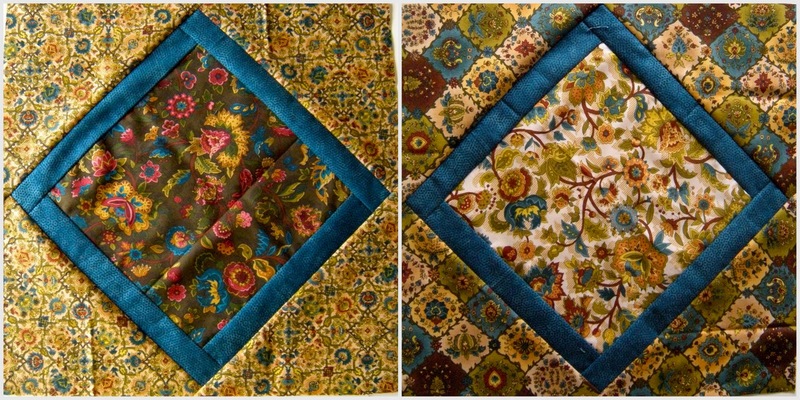 By using one piece of fabric you get a playful combination of the colours in this fabric. The thin spacers are made out of 1mm board and are slightly shorter then the bottom box itself. The ribbon is put into place as well as the paper for the bottom. After this the neck is cut to measurement from 2.5mm board and sticks out 1.5cm above the outside bottom box. This gives a nice colour contrast and keeps the lid in place on top of the bottom box. As a 'handle', a bead of stone is put in the middle of the lid with some wire. Sorry, I am very bad at remembering the names of stones, put the colour is a deep warm yellow. I am almost there! Last thing to make is the dividers to make 9 compartments for the teabags. These are also cut out of the 2.5mm board and covered with the same paper I used for the inside bottom. Finished! Were you able to follow me? Do you have the same funny habit? When I need to do something that I don't like doing or I am afraid it will turn out wrong, I tend to leave it and walk around it in circles. The water did turn red, deep red. But the fabrics stayed fine and even became more bright! Phew, this is one of those few moments a machine like this comes in handy: as soon as I could see the water was getting too dark, I just turned the program to rinse and spinning. And now this Poppy Love is hanging again! And I like it even more! I am having fun adding details to the background. There is no written pattern, just following my gut feeling. and fabrics already used in the background. 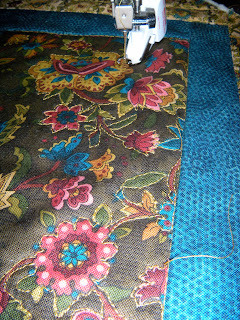 Something strange happened: with the first two cushion covers I was only able to use the BRS 2 mode of my Bernina, but with the last two ones only the BSR 1 mode wanted to work. Does anyone knows why??? I followed the instructions as written in the manual, watched some you-tube instruction films and checked out the Bernina website and blog. I prefer using the BSR 2 mode, but could not get it active again. Maybe there is something wrong with the BSR/balance button on my machine? 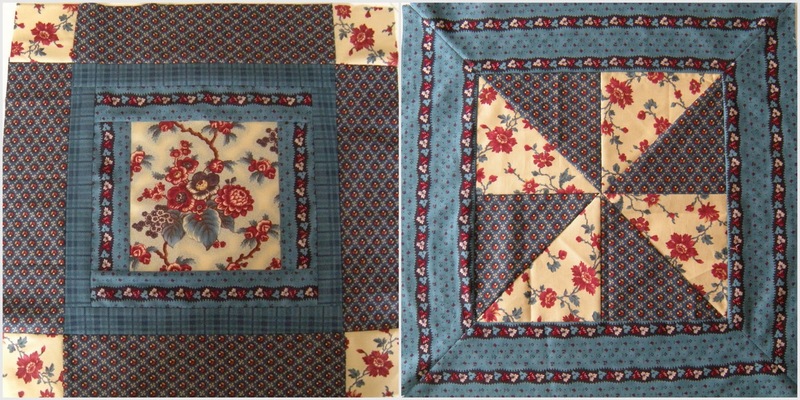 Anyway, I finished the four pieces and in the end I used the freehand quilting stitch darning foot 9 instead. Now I better get them in the mail and send them to my MIL in Holland. Last month she turned 85 and she does miss us every day. Hopefully these little cushion covers will give her a bit of comfort. And then back to my geckos, who have patiently waiting on the wall to be stitched down to their backgound! When you move to a new place, if it is only a few blocks from your old place or 10.000 Km far away, it is always nice to receive a letter in the old fashioned mail! It is like you are living there already for some time and people know where to find you! These Siggies have found their way to Brazil over the last 2 months. Every time again it is fun to see how much work everybody makes from their Siggy. I only started collecting Siggies in October last year and by now I have about 50 pieces; not enough yet to make a quilt out of it but still. Sometimes, the postman puts this stamp on the envelop... I wished he did so on all Siggy envelopes! My favorite quilt is back on the wall! 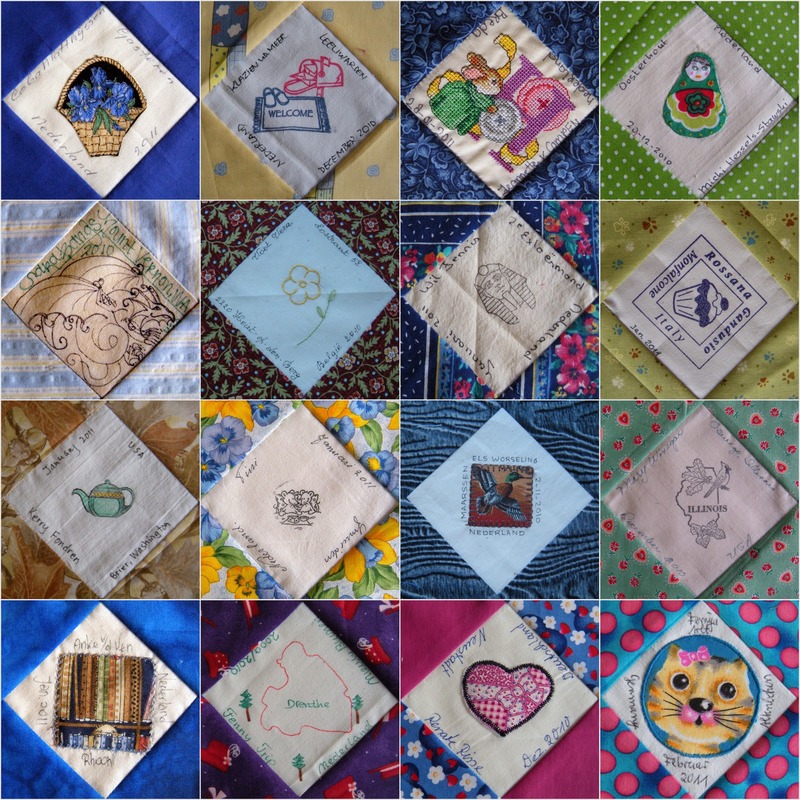 Yesterday we drilled holes for most of our pictures and for this quilt as well. It shows lovely in our 'garden-room' where the wind now breezes through the open windows and the wind-chime tingles. 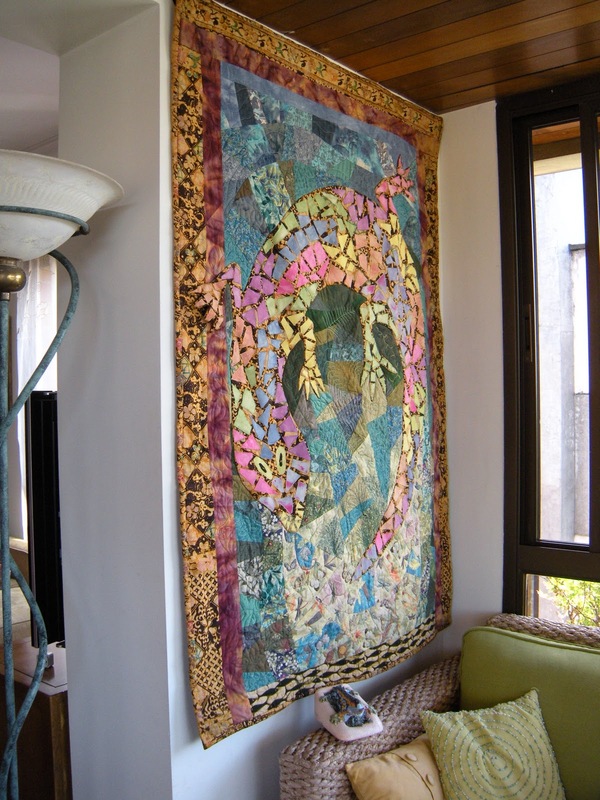 The inspiration for this quilt comes from the few years we lived in Barcelona. Parc Quell is an inspiring place to visit when you ever have the chance! If you look close, you can see I used blues for the sky, greens for the grass and insects for the bottom. 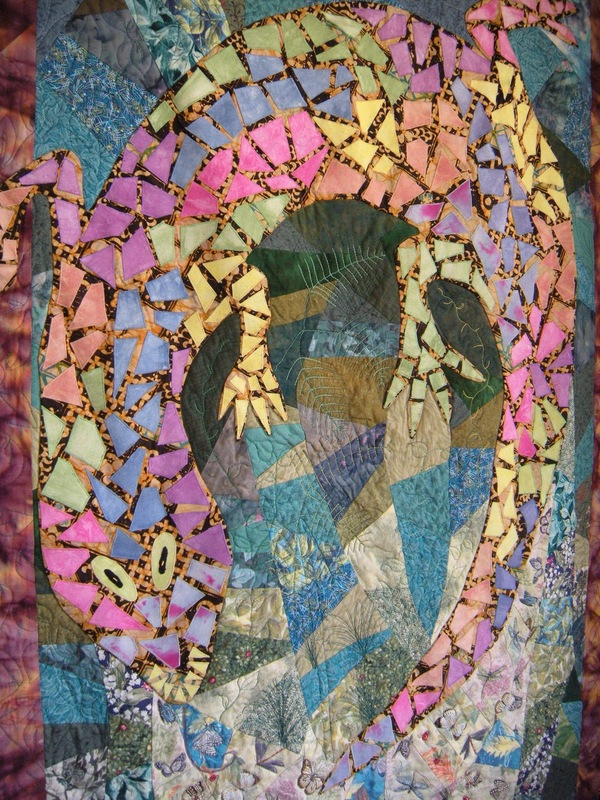 The fabric used for the mosaic on the gecko, is hand dyed. 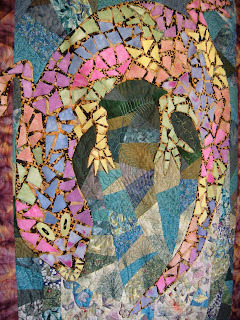 With machine quilting I added a tongue, grass, leaves and more and smaller geckos. Can you see my late afternoon visitor? 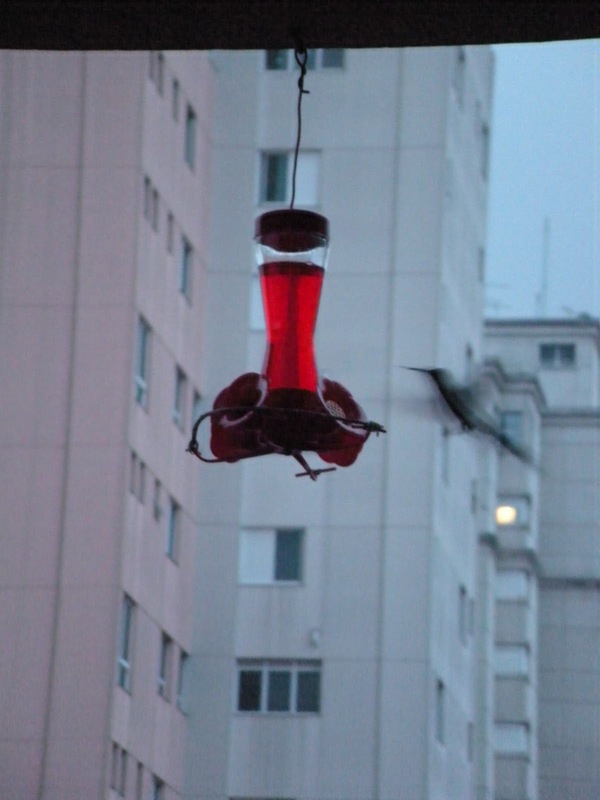 Here they call this type of hummingbird a beija-flor (literally = kiss flower). The picture is not very good, but I simply love the short visits he brings to our balcony at the 8th floor of the apartment building. 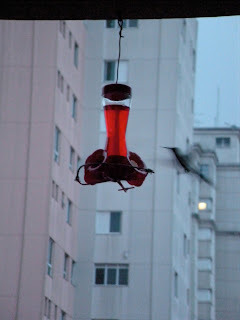 At night, while we are enjoying our dinner, he comes by to have a sip of the sugar drink from the special feeder. This is a picture of our view we have from the house: over Ibirapuera Park towards the Avenida Paulista. I am very lucky to have this view as most buildings are facing each other and you look up to other sky scrapers which are much higher than our building. A bit like on the first picture. During the day, the sky changes from colour over the park, from blue to grey to dark blue, and it is never the same. While the geckos are waiting to be needled down, I started another small project. Because that's what we all do, isn't it? My mother in low has been looking around for new cushion covers and could not find something she liked. She wants two for her bedroom and I think she needs another two for the sofa in the living room as well! 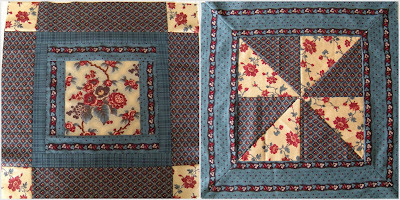 For her bedroom she wanted blue and grey, but I think a little bit of red will be just the eye catcher the cushions need on top of the quilt that is already there. Taking out these Civil War colours is just a feast! Although I am not used to working with these colours, I do like them a lot. I just drew some lines within the measurement of 40cm (16") and worked it out from there. 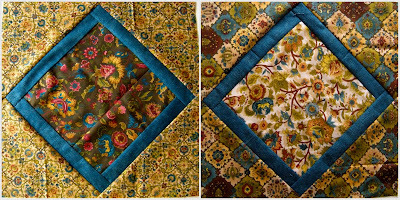 In her living room the colours are more classical, and these beautiful fabrics are just a perfect match. Next step is quilting the cushion fronts before attaching to the backs. Hmmm, I would like to continue right now, but there other things waiting to be done. Like going to the post office to get these Siggies posted to Holland and the States! After ironing on the Heat'nBond to the fabric on Tuesday, work sort of stopped. Other things had to be done in and around the house. Yesterday I started cutting out the gecko figures. What a tedious work! All those curves and little toes... Meanwhile I watched "De Wereld Draait Door", a popular Dutch program, via internet on my computer. It keeps me up to date with what's going on back home. Today I ironed the geckos to the top and I like the colour combination. One of my many boxes was holding the Bernina BSR tool, I had to do without while being in Holland. Yes, bee-girls, I found it again! Now I have to have a go with it, but it is such a long time ago I have used the BSR for the last time! As I want to applique the geckos with a free motion stitch, I better practice first on another piece of fabric. It moved along from Singapore to Vietnam and still did not get a closer look. This time around, when this one came out of one of the removal boxes, I thought I better have another look at it. Applique! Okay, so this UFO is going to be a background from now on. Next step is which kind of applique would I like to do? Something on my sewing machine it is. 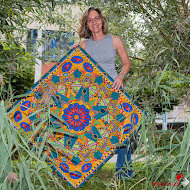 Because this top is square, the applique could be something of a round shape, a circle... a Mandala! In Hindu and Buddhist religious art you can find some beautiful circles of repetitive figures. There are many books where you can find designs for coloring and meditation, and can be used for quilting as well. The book I have is Mandala's by M. Gauding. But I am not going to meditate and sit still, no, I want to work with my fabrics! Going through my stash of Kaufman's batiks I choose a few to make more contrast. And while selecting the fabrics I knew what I was going to do: geckos! A design of a circle of geckos which a lady in Singapore, Brigitte Lee, once gave to me.